Christine Cockburn is our Group Visit Organiser and is a well-seasoned expert in choosing places of interest and organising coach trips for people to visit them. A wonderfully interesting day was enjoyed by all. On a glorious sunny day, 32 members and friends set off for what proved to be a most informative and enjoyable day out. Our first call was for refreshments at the cafe within The Making Rooms, “a digital creative hub in the heart of Blackburn” situated on Exchange Street. This is an exciting place providing free technical support and workshops for the local community, for design and manufacture. There are opportunities to design and make, using creative machinery and software. After enjoying our drinks we were able to see the various items made in the community workshops. It is also a business venture having offices, studios, machines for hire and bespoke workshops. There are plans to link The Making Rooms to the Museum via a corridor. At the Art Gallery we were greeted by a volunteer who showed us some of the highlights of the extensive display. It was interesting to note that the Gallery owned many paintings by artists in our own collection, namely Richard Ansdell, Bernard de Hoog, John Linnell, Edwin Hayes, T S Cooper and William Huggins. A magnificent seascape by Julius Olsson R A was of particular note as he was a patron of Lytham St Annes Art Society and had visited Lytham to give a lecture and open an exhibition. Blackburn’s Museum is an absolute treasure and, as in all good museums, has so much to see and so much information to impart. Particularly impressive were the collections donated by benefactors, Robert Edward Hart, 1878-1946 and Thomas Boys Lewis, 1869 -1944. Both were educated at Cambridge where they developed a taste and critical eye for rare artefacts. They amassed huge collections which the Museum was eventually to inherit. The former’s collection consists of rare books and coins and the latter’s Japanese art and artefacts. For many of us the exhibition of the social history of Blackburn was particularly engrossing. I had a personal interest in the WW1 cabinet which described the involvement of the 11th Battalion East Lancashire Regiment (The Accrington Pals ) and the battle at Ploegstreet Wood. My Darwen born grandfather belonged to this regiment and died at Ploegstreet Wood in September, 1918. The volunteers, who were very enthusiastic and well informed, told us how the Museum was greatly in need of funding and how volunteer stalwarts were heavily relied upon to keep it open. We then travelled to Blackburn Cathedral where we listened to an organ recital by an award winning musician, Robbie Carroll. A delicious lunch was served at a cafe in the crypt before our final guided tour of one of England’s newest cathedrals. Blackburn Cathedral is built on a site where Christian worship dates back to 596. Formerly the Parish Church of Blackburn, and devoted to St Mary the Virgin, it is where some of my Victorian ancestors were married. It has recently been extended, the first such addition to an English cathedral in 500 years. 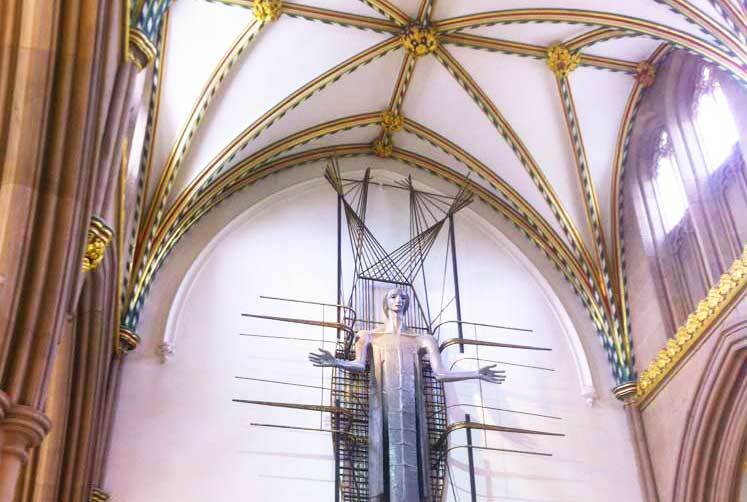 The guide drew our attention to such features as the corona over the high altar and the angel above it, the Christ the Worker sculpture, the Jesus Chapel and the very modern paintings of the Stations of the Cross entitled The Journey. Being so different from traditional church art they have been quite controversial. The guide also pointed out a sculpture of Madonna and Child by Josefina de Vasconcellos, 1904-2005. This was of special interest to us as the artist died in Blackpool Victoria Hospital. It was a wonderful day out and we thanked our Events Organiser, Christine Cockburn, for her meticulous planning.